Robert King Wilkerson is a former member of the Black Panther Party. 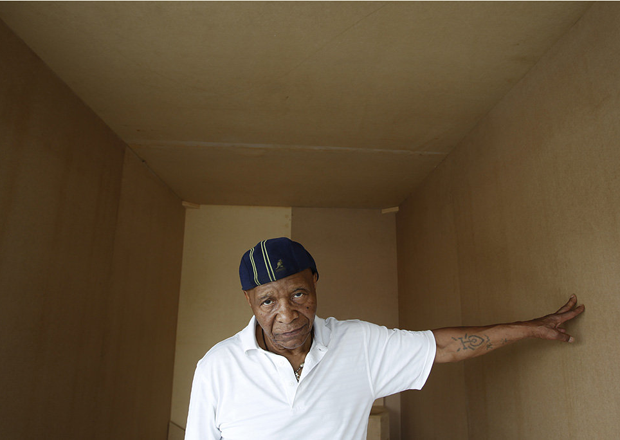 He spent 29 years in solitary confinement in the Louisiana State Prison aka Angola Prison for a crime that prison officials pinned on him in an effort to neutralize his effective organizing abilities. They planned to keep him in a 6×9 cell for the rest of his life, but he finally proved his innocence and was released in February of 2001. Since his release, King has worked to free two other former Black Panthers, Albert Woodfox and Herman Wallace, who are still incarcerated at Angola. They were also framed and even though extensive proof of their innocence has been established, both still remain in solitary confinement after 34 years! Collectively, they are referred to as the Angola 3. Posted in Uncategorized and tagged Angola 3, Black Panthers, political Prisoners, Robert King. Bookmark the permalink. Since 1972, Wallace and Woodfox have been brought before more than 150 prison boards where their unprecedented duration in solitary confinement has been reviewed only for them to be sent straight back to their cells. The only explanation given: “Nature of the original reason for lockdown”.